Are you ready to learn how to make easy, delicious Indian dishes worthy of any top notch Indian restaurant? Then don’t miss this fabulous new chef recipe series brought to you by I Love Cooking in association with Award Winning Chef Sunil Ghai one Ireland’s most talented Indian Chefs. Learn how to make a Tadka Dal. This quick and easy vegetarian dish from Northern India is famous for its spicing. Rinse the dry lentils 3-4 times until the water runs clear. Place in bowl and cover with plenty of water, leave to soak for about ½ an hour. Drain lentils and place in a large pot with 1l of water. Stir in the turmeric, salt and fresh ginger. Bring to a boil, then reduce heat and simmer for 15-20 minutes until the lentils are soft and cooked through. Heat a generous drizzle of oil in a large saucepan over medium heat. Break the dry red chilli in half and add to the hot oil along with the cumin seeds, green chilli, onion and garlic. Cook for 30 – 60 seconds just until fragrant and starting to turn a light golden brown. Add the dry spices and salt and cook for another 60 seconds, then add the tomato. Cook for 3-4 minutes until the tomato has started to soften and break down. Stir in a splash of water then add the cooked lentils. Add another splash of water to thin the sauce if needed, then leave to simmer for 10-15 minutes. At the end of cooking, stir in the fresh coriander and a squeeze of lemon juice. Serve hot with more coriander for garnish and a drizzle of chilli oil, if desired. Sunil’s home city of Gwalior was an ideal starting point for his career as an aspiring chef he says. Known as the city of music it boasts over 400 years of royal music patronage, which also brought with it the best cuisine from every corner of the nation. Sunil’s first passion in life was cricket followed by his mother’s first love – cooking. “The wonderful thing about growing up in Gwalior was the eclectic influences all around you. 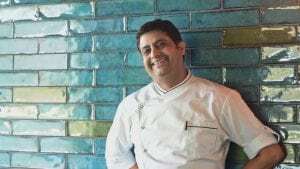 It’s a melting pot of culinary delights from all over the many different regions of India,” says Sunil.